This agreement applies as between you, the User of this Web Site and Allgenericmeds.net . Your agreement to comply with and be bound by these Terms and Conditions and the Patient Responsibility Agreement (which is incorporated into these terms and conditions by this reference) is deemed to occur upon your first use of the Web Site. If you do not agree to be bound by these Terms and Conditions and the Patient Responsibility Agreement, you should stop using the Web Site immediately. The Service and the Web Site are provided by Allgenericmeds.net . means the website that you are currently using (Allgenericmeds.net) and any sub-domains of this site unless expressly excluded by their own terms and conditions. If Goods are being ordered from outside Allgenericmeds.net 's country of residence, import duties and taxes may be incurred once your Goods reach their destination. Allgenericmeds.net is not responsible for these charges and we undertake to make no calculations or estimates in this regard. If you are buying internationally, you are advised to contact your local customs authorities for further details on costs and procedures. As the purchaser of the Goods, you will also be the importer of record and as such should ensure that your purchase is in full compliance with the laws of the country into which the Goods are being imported. Please be aware that Goods may be inspected on arrival at port for customs purposes and Allgenericmeds.net cannot guarantee that the packaging of your Goods will be free of signs of tampering. This Web Site may contain links to other sites. Unless expressly stated, these sites are not under the control of Allgenericmeds.net or that of our affiliates. We assume no responsibility for the content of such web sites and disclaim liability for any and all forms of loss or damage arising out of the use of them. The inclusion of a link to another site on this Web Site does not imply any endorsement of the sites themselves or of those in control of them. You acknowledge that Allgenericmeds.net reserves the right to monitor any and all communications made to us or using our System. It is recommended that you do not share your Account details, particularly your username and password. Allgenericmeds.net accepts no liability for any losses or damages incurred as a result of your Account details being shared by you. If you use a shared computer, it is recommended that you do not save your Account details in your internet browser. If you have reason to believe that your Account details have been obtained by another without consent, you should contact Allgenericmeds.net immediately to suspend your Account and cancel any unauthorised purchases that may be pending. Please be aware that purchases can only be cancelled until they are dispatched. In the event that an unauthorised purchase is dispatched prior to your notifying us of the unauthorised nature of the purchase, Allgenericmeds.net accepts no liability or responsibility and you should make contact with the Carrier detailed in the Purchase Information. Either Allgenericmeds.net or you may terminate your Account. If Allgenericmeds.net terminates your Account, you will be notified by email and an explanation for the termination will be provided. Notwithstanding the foregoing, we reserve the right to terminate without giving reasons. If Allgenericmeds.net terminates your Account, any current or pending purchases on your Account will be cancelled and will not be dispatched. Allgenericmeds.net reserve the right to cancel purchases without stating reasons, for any reason prior to processing payment and dispatch. Whilst every effort has been made to ensure that all graphical representations and descriptions of Goods available from Allgenericmeds.net correspond to the actual Goods, Allgenericmeds.net is not responsible for any variations from these descriptions. This does not exclude our liability for mistakes due to negligence on our part and refers only to variations of the correct Goods, not different Goods altogether. Allgenericmeds.net does not represent or warrant that such treatment will be available. Stock indications of our pharmacies are not provided on the Web Site. All pricing information on the Web Site is correct at the time of going online. Allgenericmeds.net reserves the right to change prices and alter or remove any special offers from time to time and as necessary. 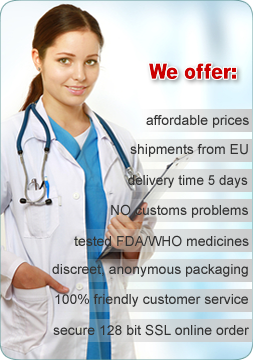 Goods are despatched by Allgenericmeds.net and will be delivered by a Carrier. 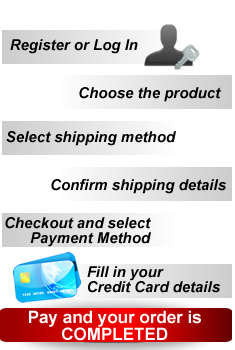 Allgenericmeds.net will notify you by way of email when your goods are to be dispatched to you. The message will contain details of estimated delivery times in addition to any reasons for a delay in the delivery of the Goods purchased by you. If Allgenericmeds.net receive no communication from you, within 14 days of delivery, regarding any problems with the Goods, you are deemed to have received and accepted the Goods in full working order and with no problems. If due to some reason you don't receive your ordered products in maximum 30 days, Allgenericmeds.net will make a new delivery. Goods are supplied by Allgenericmeds.net . Allgenericmeds.net aims to always provide high quality Goods that are fault free and undamaged. On occasion however, Goods may need to be returned. Returns are governed by our Returns Policy, which is incorporated into these terms and conditions by this reference. Allgenericmeds.net makes no warranty or representation that the Web Site will meet your requirements, that it will be of satisfactory quality, that it will be fit for a particular purpose, that it will not infringe the rights of third parties, that it will be compatible with all systems, that it will be secure and that all information provided will be accurate. We make no guarantee of any specific results from the use of our Services. Allgenericmeds.net reserve the right to change the Web Site, its Content or these Terms and Conditions at any time. You will be bound by any changes to the Terms and Conditions from the first time you use the Web Site following the changes. If Allgenericmeds.net is required to make any changes to Terms and Conditions relating to sale of Goods by law, these changes will apply automatically to any orders currently pending in addition to any orders placed by you in the future. The Service is provided "as is” and on an "as available” basis. Allgenericmeds.net gives no warranty that the Service will be free of defects and / or faults. To the maximum extent permitted by the law Allgenericmeds.net provide no warranties (express or implied) of fitness for a particular purpose, accuracy of information, compatibility and satisfactory quality. Allgenericmeds.net accepts no liability for any disruption or non-availability of the Web Site resulting from external causes including, but not limited to, ISP equipment failure, host equipment failure, communications network failure, power failure, natural events, acts of war or legal restrictions and censorship. To the maximum extent permitted by law, Allgenericmeds.net accept no liability for any direct or indirect loss or damage, foreseeable or otherwise, including any indirect, consequential, special or exemplary damages arising from the use of the Web Site or any information contained therein. Users should be aware that they use the Web Site and its Content at their own risk. Nothing in these Terms and Conditions excludes or restricts Allgenericmeds.net s liability for death or personal injury resulting from any negligence or fraud on the part of Allgenericmeds.net respectively. Nothing in these Terms and Conditions excludes or restricts Allgenericmeds.net 's liability for any direct or indirect loss or damage arising out of the incorrect delivery of Goods or out of reliance on incorrect information included on the Web Site.